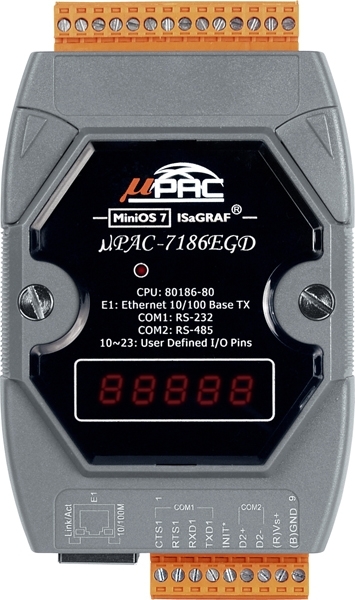 The μPAC-7186EG Series (μPAC-7186EG, μPAC-7186EGD) is a palm-size PAC and includes ISaGRAF SoftLogic. It has one 10/100 Base-TX Ethernet port, one RS-232 port and one RS-485 port. The user can choose an I/O expansion board, X-Board, to expand the I/Os or memories of μPAC. 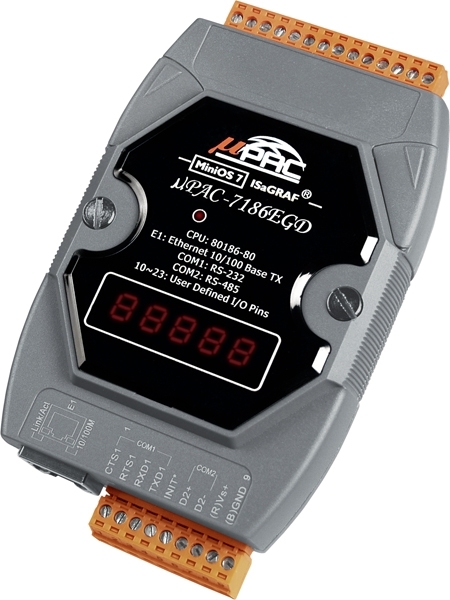 μPAC-7186EG support Modbus Serial protocol, Modbus TCP/IP protocol, Modbus Master protocol, Remote I/O, Fbus, Ebus, SMS: Short Message Service, modem link, MMICON/LCD, ZigBee wireless communication, GPS application, FRnet, CAN remote I/O connection and user defined protocol. The I-7188XG series (I-7188XG, I-7188XGD) is a palm-size PAC with ISaGRAF SoftLogic. It has 2 Serial ports (COM1:RS-232/RS-485 & COM2:RS-485). The user can choose an I/O expansion board, X-Board, to expand COM Ports, I/Os or memories of I-7188XG and μPAC-7186EG Series. Protocol A max. of 2 ports: I-7188XG COM 2 ~ 3, μPAC-7186EG COM 1~ 3 (*). A max. of Mbus_xxx Function Block amount for 2 ports: μPAC-7186EG: 128; I-7188XG: 64. Protocol A max. of 2 ports: COM1, one of COM2 or COM3 (*). Protocol Ethernet port supports Modbus TCP/IP Slave protocol for connecting ISaGRAF & PC/HMI. μPAC-7186EG: up to 6 connections; I-7188XG: 0 connection. User-defined Protocol Custom protocols can be applied at μPAC-7186EG: COM1 ~ 8 or I-7188XG: COM2 ~ 8 using Serial communication function blocks. (*). Remote I/O One of COM2 or COM3:RS-485 (*) supports I-7000 I/O modules, I-87K base + I-87K Serial I/O boards, or RU-87Pn + I-87K High Profile I/O boards as remote I/O. A max. of 64 I-7000/87K remote I/O modules can connect to one PAC. Fbus Built-in COM2 Port to exchange data between ICP DAS's ISaGRAF controllers. Used to exchange data between ICP DAS ISaGRAF Ethernet PACs via the Ethernet port. Provide functions to send email to a max. of 10 receivers with a single attached file via the Ethernet port through internet. If applying with an X607/608 X-Board, it could send Email with a single attached file and the maximum of file size is about X608:488 KB or X607:112 KB. MMICON/LCD COM3: RS-232 (*) supports the ICP DAS MMICON. The MMICON is featured with a 240 x 64 dot LCD and a 4 x 4 Keyboard. User can use it to display picture, string, integer, float, and input a character, string, integer and float. The slot0 of two PAC are plugged in one X107 and connect to I/O modules, one is Master, one is Slave. Master handles all inputs & outputs at run time. If Master is damaged (or Power off), Slave takes the control of Bus7000b. If Master is alive again, it takes the control of Bus7000b again. The change over time is about 5 seconds. Control data is exchanging via Ebus (if using a cross cable, there is no need of any Ethernet switch). All I/O should be RS-485 I/O except the status I/O in the slot 0: X107. Pulse Width Modulation Output All X-board series DO boards support PWM output. 8 channels Max. for one controller. Parallel DI Counter All X-board series DI boards support DI counter. * Note: The COM3 ~ COM8 are located in the optional X-board series if it is installed inside the μPAC-7186EG & I-7188XG. * ICP DAS recommends using NS-205/NS-208 or RS-405/408 (Ring Switch) Industrial Ethernet Switches. Note: No upgrade service from ISaGRAF-32 to ISaGRAF-256 is available.